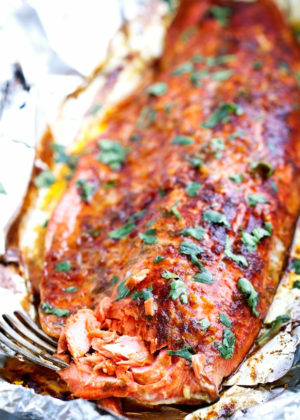 The best baked salmon in foil recipe EVER! Brushed with my lime and chili sauce, dusted with a hint of cumin, and chipotle chili. This recipe is so easy to make and pulls together in less than 30 minutes! The salmon is so flakey and tender when baked inside foil. Salmon in Foil. Are you a fan? Say hello to my absolute favorite way to eat salmon. It’s almost become the only way I ever make salmon anymore. Tender, flakey, and buttery salmon baked in foil so that it’s steamed and then broiled for just a few minutes to get that nice gaw-jus color on top that makes me want to eat salmon all day long. And when I tell you that this chili-lime salmon recipe is super easy to pull together on a weeknight and requires about 10 ingredients and that you’ll get smiles and happy bellies from the whole family, I ain’t lyin’. It’s as simple as tossing a few ingredients into a small saucepan and basting your salmon filet with a sweet chili lime sauce and popping it in the oven to cook a super fancy meal on a weeknight timeline. BEWARE, this recipe is so delicious and so simple to make that you may be tempted to prepare it more than a few nights out of the week. Hello little fishy, where have you been all my life? Okay, bear with me while I get on my soapbox for just one whole second. When you’re baking salmon, I highly, highly, borderline harassingly, urge you to purchase good quality salmon. Wild caught is always best. The natural flavors of the salmon play such a key role in how your final recipe will turn out. I find that using ‘pink salmon’ will leave you wishing you hadn’t used it. Pink salmon tends to remain wet, and looks kind of gross when it comes out of the oven. I’ve said it before, and i’ll say it again, it’s not the recipe, it’s the fish. 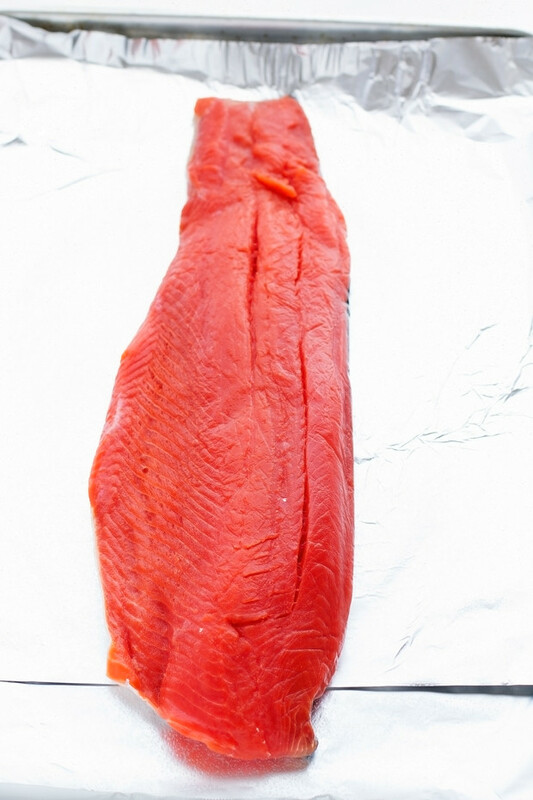 My favorite kind of salmon for this recipe is Sockeye or Coho. I used sockeye salmon this time. It’s easy to spot because of it’s vivid red and orange coloring. Whatever you do, please, oh PAUL-ESE, use good salmon. Okaythanksbye. A few months back I brought you this  recipe which you guys made and left so many wonderful comments on the blog, Instagram , and even a few private Facebook  messages saying that not only the people that found salmon to be super intimidating but even the ‘non-fish eaters’ of the family enjoyed this recipe and found it pretty easy to pull together. You guys, i’m giddy with joy, this makes me feel so warm and fuzzy wuzzy on the inside. I love nothing more than making food that you and your family love and enjoy (read: binge eat). 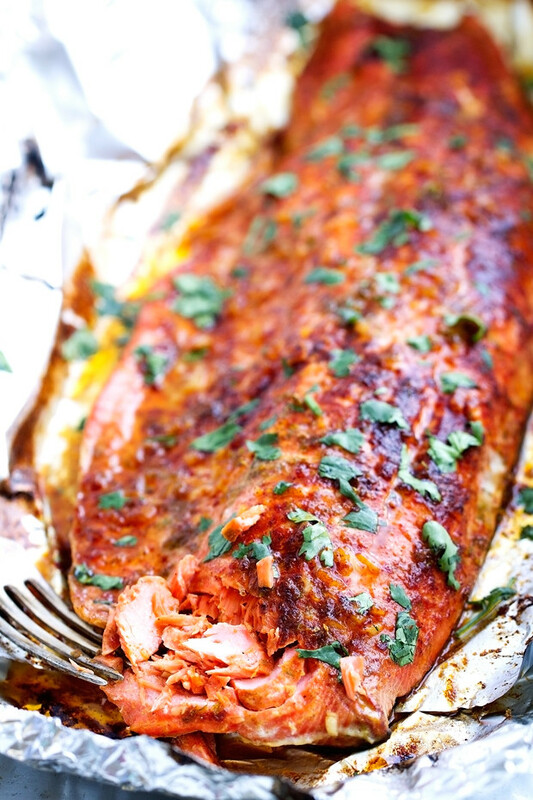 So let’s talk chili-lime salmon in foil. This baked salmon recipe takes about 30 minutes from start to finish. And the best part? Clean-up takes about 30 seconds! So when you’re all done with the salmon, just wrap up the foil into a ball and take your best shot at the trash can. Well, there is that teeny-tiny wittle saucepan left but that’ll go right into the dishwasher along with the plates. It’s worth cleaning up that saucepan. So worth it. 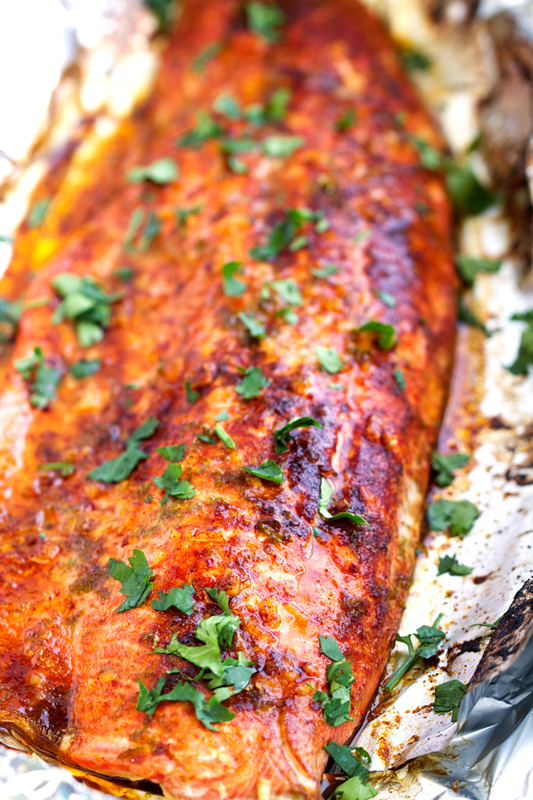 Start by making a quick 2 minute chili-lime butter that we use to baste the salmon with before it goes into the oven. It’s simple ingredients that I know you have at home – red pepper flakes, butter, lime juice, garlic, and honey. Line your baking sheet with foil and place the fish on, drizzle on the chili-lime butter sauce and sprinkle with a hint of cumin, lime zest, and some chipotle chili powder. Into the oven it goes, and the most magnificent smells will torture you for the next 12 minutes of your life. By the by. Since it’s summertime and all, we could totally just place the salmon in foil onto a hot grill and let it cook up for about the same amount of time. Just feel for firmness. Open up the foil in the last few minutes of cooking so the color develops. Barbecued salmon is the bomb-diggity. 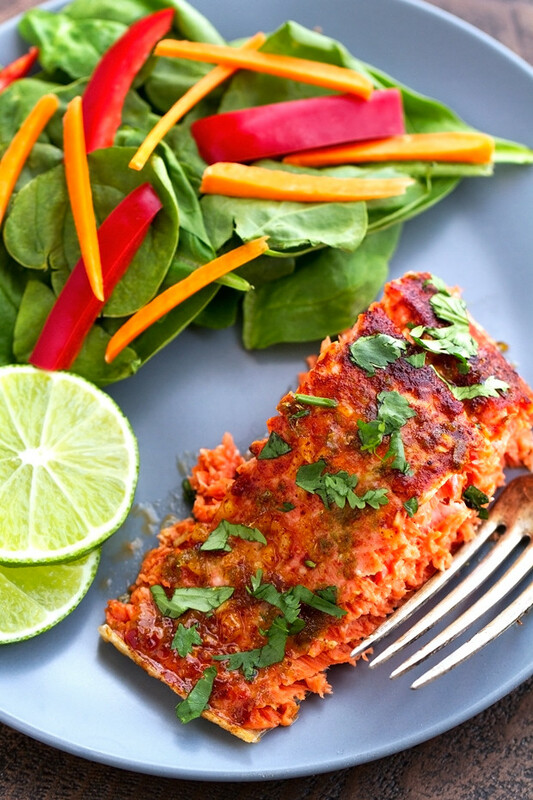 If you’re entertaining this weekend, give this chili-lime salmon recipe a go. And your guests totally do NOT need to know that you spent about 10 minutes of hands on time making a meal that’s perfect for summer and EASY. Ways to serve this up? You know I wouldn’t leave you hangin’. With a simple spinach and avocado salad. Wrapped in tortillas with all of your favorite taco fixings, and maybe a little mango salsa action on the side. With a wild rice pilaf. In a saucepan over medium heat, combine the lime juice, red pepper flakes, honey, garlic, and salt. Allow the lime juice to reduce to 1 tablespoon. Add in 1 tablespoon of butter, remove pan from heat and swirl so the butter strts to melt. Place back on the heat for a few seconds, removed and continue to swirl until butter completely melts. Repeat with second tablespoon of butter. When butter is completely melted, remove sauce from stove. Place the salmon filet in a piece of foil large enough to fold over and seal. Using a brush or spoon, brush the salmon with the lime butter sauce. Season with the cumin powder, lime zest, and chili powder. Cover with foil so that all sides are properly closed so the sauce does not leak. Bake the salmon for 12-14 minutes or until firm. Open the foil and allow the fish to broil under the broiler for 2-3 minutes, keeping an eye on it so the fish does not burn. Remove from oven, top with chopped cilantro. Serve immediately. Baking time may vary slightly due to thickness of fish. Feel for firmness on the thickest part of the filet to make sure your fish is cooked through. 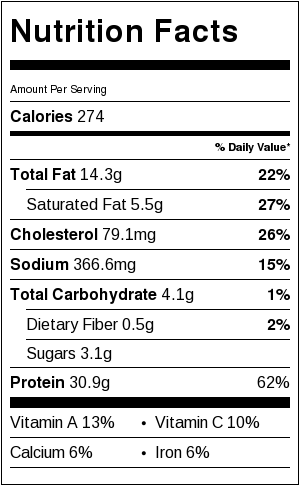 The salmon can also be wrapped in foil and barbecued at 375ºF for about the same amount of time give or take a minute or two. Allow the salmon to ‘broil’ the same way you would in the oven, by opening the foil and allow the fish to dry out for just 1-2 minutes.